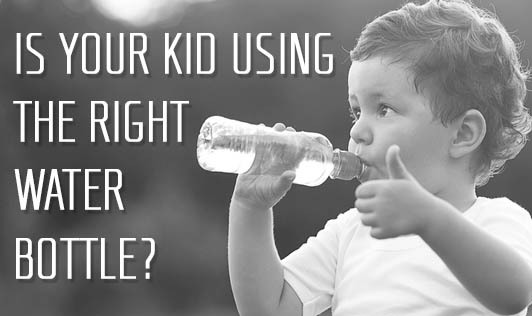 Is Your Kid Using the Right Water Bottle? Providing your child with fresh, cool and safe drinking water is not an easy task. Apart from the water bottle being home for various disease causing micro-organisms, the material of the bottle might be leaching out carcinogenic substances into the water. Isn't that unsafe for your child? Here are few tips on how to buy and maintain water bottles for your kids. • Do not buy pet water bottles that are made of low quality plastic known to pose health issues. • Buy a light weight stainless steel coated water bottle that is the safest of all. Stainless steel containers are easy to clean, deodorize and sterilize. • Water bottles should not have sharp edges or small detachable parts that can cause a choking hazard. • Water bottles with sippers are more convenient for kids rather than a big or a narrow mouthed one. However, these sippers need to be cleaned very well before every use. • To make the water bottle look more attractive to your kid, you can stick to his favorite cartoon character stickers that are water proof. This can also encourage him to drink more water through the day! How to maintain hygiene in water bottles? • Make sure to wash the bottles every night and dry it before you fill in drinking water. • Don't forget to brush the bottles from inside. • Wash the water bottle with warm water and soap and then fill it with vinegar to one fifth of the container. Allow it to sit overnight and rinse it off in the morning. This should be done every few days. • Do not use water bottles to fill other liquids like fruit juices or milk as this can contaminate the bottles faster. • Teach your kid to close the nozzle of the bottle after using it every time. • If there is a sipper or a straw, make sure you wash them thoroughly every day. Also, if your child is unwell, see to it that the sipper/straw is not shared with a younger sibling. It could spread infections. Feel safe that you are giving your child germ - free and chemical - free water from safe water bottles by following these simple tips.